West Benton Fire Rescue is committed to protecting and enhancing the quality of life within the City of Prosser and surrounding communities with a comprehensive program of fire and medical services directed toward public safety. 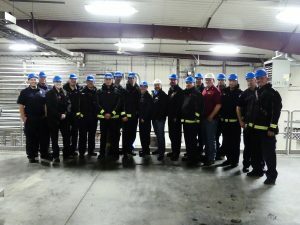 Education is the most effective weapon in West Benton Fire Rescue’s arsenal of fire prevention tools, with all Fire Department personnel active participants in fire prevention and life-saving educational efforts. WBFR strives to provide residents with information about fire hazards, how to correct them, and what to do if a fire does occur. Our staff is dedicated to those we serve. West Benton Fire Rescue is devoted to providing Prosser and the surrounding areas the tools to garner safer living habits and awareness to reduce the number of fires, injuries, and deaths. If you have any questions or would like the department to provide a life safety program please contact us, or call the office at (509) 786-3873. It’s no news to you that smoke alarms save lives. But do you have a working smoke alarm in your home? If so, is it in proper working condition? Is your current alarm past the manufacture’s date? We offer a free smoke alarm check and will come to your home to ensure your smoke detector is working, installed in the right location, and is ready to save your life in the event of a fire. In partnership with Cook’s Ace Hardware and a grant from Washington River Protection Solutions (WRPS), West Benton Fire Rescue is able to offer free smoke alarms, including batteries and installation for the residents of West Benton Regional Fire Authorities jurisdiction. Complete the Smoke Detector Program Request on the Forms page to request a free smoke alarm, which the firefighters will then install for you, for free. Then, contact us or call 509-786-3873 for further information and assistance. Learn more about the importance of Smoke Alarms. KNOX Rapid Entry Devices are Purchased by Property Owners – the Fire Department assists with Installation. KNOX devices give emergency responders rapid entry into your property. The Fire District holds the one Knox Master Key to homes, community buildings, gated complexes and fenced properties with immediate access. What is a KNOX BOX system? It’s a high-security box system, designed to give firefighters and emergency services immediate access to locked buildings, elevators, and other secured areas. Why install a KNOX BOX? Installation of a KNOX BOX on your property will not only allow firefighters faster access in case of an emergency, but will also prevent expensive forcible entry should emergency services be required while the premises are unoccupied. Costly front doors and entry ways needn’t be harmed if entry keys are available on-site! How does the KNOX BOX system work? Following your purchase of a KNOX BOX from the factory, you will mount it securely on the exterior of your building. All necessary access keys will be locked inside by a representative of the fire department; only the fire department’s master key can open the box. The KNOX BOX gives the fire department a simple alternative to expensive, time-consuming forcible entry. How secure is a KNOX BOX system? Security has always been a KNOX strong point. Designed for maximum protection, each virtually indestructible box features a special high-security Medeco lock and key. This Medeco restricted locking system guards against unauthorized key duplication. Keys aren’t even available to locksmiths or lock distributors–only The KNOX Company can supply these keys! The Knox Box system offers maximum security at every step. Who can authorize a KNOX BOX system? Strict security control is maintained by allowing only fire departments to authorize the purchase of each Knox Box. An authorized fire department official, whose signature is on file at the factory, must approve the order. After verifying the signature, the Knox box is shipped directly to you. Each Knox Box is shipped without keys, locked in an open position and ready for mounting. How is a KNOX BOX installed? Each KNOX BOX is shipped with complete mounting instructions; however, your fire department will assist you in choosing a proper location for mounting. After installation is completed, the fire department will conduct an inspection of the installation and lock building keys inside the box. As soon as building keys are locked inside the box, it is ready to provide immediate access to emergency personnel– 24 hours a day, 365 days a year. Contact Us to work with you on the installation, as soon as you’ve received your Knox Box. Motor vehicle crashes are the No. 1 cause of unintentional death among children in the United Sates (Source: Center for Disease Control and Prevention.) One CDC study found that, in one year, more than 618,000 children ages 0-12 rode in vehicles without the use of a child safety seat, booster seat or a seat belt at least some of the time. Of the children ages 12 years and younger who died in a crash in 2015 (for which restraint was known), 35% were not buckled up. When installed and used correctly, child safety seats and safety belts can prevent injuries and save lives. Child safety seats can reduce the risk of death to infants (aged <1 year) by 71% and to toddlers (ages 1 to 4) by 54% in passenger vehicles. Booster seat use reduces the risk for serious injury by 45% for children aged 4-8 years when compared with seat belt use alone. Child restraint systems are often used incorrectly. An estimated 46% of car and booster seats are misused in a way that could reduce their effectiveness. West Benton Fire Rescue offers child safety seat inspections for residents who are interested in having their child safety seats inspected by a certified passenger safety seat technician. Car seat inspections are free to all West Benton Fire Rescue residents, but we encourage you to set up an appointment prior to the inspection, by contacting us or calling (509) 786-3873. While West Benton Fire Rescue firefighters will do their best to fulfill all appointments, West Benton Fire Rescue’s first priority is emergency response. If the firefighters are responding to an emergency and are not at the station at the time of your appointment, you may wait a few minutes to see if they return, or call to reschedule for another time. Make sure children are properly buckled up in a car seat, booster seat, or seat belt, whichever is appropriate for their age, height and weight. For the best possible protection, infants and children should be buckled in a rear-facing car seat, in the back seat, until age 2 or when they reach the upper weight or height limits of their particular seat. Check the seat’s owner’s manual and/or labels on the seat for weight and height limits. When children outgrow their rear-facing seats they should be buckled in a forward-facing car seat, in the back seat, until at least age 5 or when they reach the upper weight or height limit of their particular seat. Check the seat’s owner’s manual and/or labels on the seat for weight and height limits. Once children outgrow their forward-facing seat, (by reaching the upper height or weight limit of their seat), they should be buckled in a belt positioning booster seat until seat belts fit properly. Seat belts fit properly when the lap belt lays across the upper thighs (not the stomach) and the shoulder belt lays across the chest (not the neck). Remember to keep children properly buckled in the back seat for the best possible protection. Children no longer need to use a booster seat once seat belts fit them properly. Seat belts fit properly when the lap belt lays across the upper thighs (not the stomach) and the shoulder belt lays across the chest (not the neck). For the best possible protection keep children properly buckled in the back seat. Install and use car seats and booster seats according to the seat’s owner’s manual or get help installing them from a certified Child Passenger Safety Technician. Buckle all children aged 12 and under in the back seat. Airbags can kill young children riding in the front seat. Never place a rear-facing car seat in front of an air bag. Buckle children in car seats, booster seats, or seat belts on every trip, no matter how short. Set a good example by always using a seat belt themselves. West Benton Fire Rescue conducts annual fire and life safety inspections of commercial businesses throughout our service area. By identifying potential hazards in advance we are better able to keep citizens and first responders safe in the event of an emergency. Please contact the West Benton Fire Rescue to setup a time to tour your facility. In 1984, a release of deadly methyl isocyanate gas in Bhopal, India, resulted in the deaths of thousands of people living near a chemical plant. This incident emphasized the need for communities to be informed of hazardous materials in their midst and to plan for possible chemical emergencies. Tier II is the second half of a chemical inventory reporting format that was created with a two-tier approach, Tier I and Tier II. Since this type of reporting was created, most all Local Emergency Planning Committees (LEPC) and State Emergency Response Commissions (SERC) have required only the second half of the chemical reporting, Tier II. As a part of our mission to educate the public, West Benton Fire Rescue offers free CPR and First Aid classes to individuals and groups within the Prosser area. Lives are lost daily nationwide from incidents involving heart attack, drowning, choking or electric shock. The steps taken to aid the victim seconds following such an incident can mean the difference between life and death. Cardiopulmonary resuscitation (CPR) is the best training to have to try to help someone in an extreme situation when that person has stopped breathing. Learning this basic first-aid technique can help you give a friend, a loved one or a stranger a second chance for life. This CPR course teaches the lifesaving skills of adult Hands-Only CPR, adult CPR with breaths, child CPR with breaths, adult and child AED use, infant CPR, and mild and severe airway block for adults, children, and infants. Skills are taught in a dynamic group environment which provides students with the most hands-on CPR practice time possible. This course is ideal for community groups, new parents, grandparents, babysitters, and others interested in learning how to save a life. This CPR course will be scheduled periodically throughout the year depending on demand and also available upon request to groups of 5-10 students. There is no cost or fees for this course and you do not need to bring anything. Everything you need will be provided. There is a practical component to this course, so please wear comfortable clothing. Part of the practical portion will involve practicing compressions with a manikin placed on the floor. If you are unable to practice compressions on the floor for any reason, we will be more than happy to make accommodations for you. By appointment. Please contact our department to schedule a class. What is a Fire and Life Safety Inspection? high volume cooking, hazardous materials or other dangerous processes. Why does City of Prosser provide all Fire and Life Safety inspections in the City of Prosser? could not continue to provide the service at no charge to the businesses in the City. have them certified to perform these inspections. knowledge and expertise in all things public safety related. What about a Fire and Life Safety Inspection for my home? family to be safe should there be a fire related incident at your home.